The 2013 Freestyle Kayaking World Championship has come to a close, and folks in the Nantahala Gorge are settling back to a life of quiet beauty in the North Carolina mountains. But the recent feats of athleticism and adventure have sparked a renewed interest in canoes, kayaks, and hand-propelled boats in the hearts of many nature lovers. Kayaking is one of the fastest growing sports in the world, and with the beautiful views from our Reflection real estate, it’s not hard to see why. 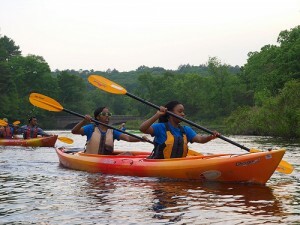 Whether you’re sweeping down the rapids of the Ocoee River or paddling the placid waters of Lake Nantahala, here are a few tips to get you started on your kayaking excursion. The key to any new venture is starting out safely and slowly. Stock up on sunscreen, grab your life-vest, and store a safety kit in the bottom of your boat. Chances are you won’t need your flashlight and bandages, but it’s better to have them on hand—along with your phone or radio—just in case you hit some turbulent waters. Although picking your kayak is probably more fun, researching your paddle is an important consideration when heading toward the lake. Kayaking involves physical exertion, so it’s important to find a paddle that works with you. Choose the right size, style, and synthetic material for your strength and skill. When you’re prepped to go, use short, powerful strokes to propel you across the lake surface. Practice often to develop your muscles and improve your form and endurance. Whether you’re training for canoeing competitions or simply enjoying the meditative relaxation inherent in the warm sun and clear waters of Lake Nantahala, learning to kayak is a great way to enjoy your North Carolina home. 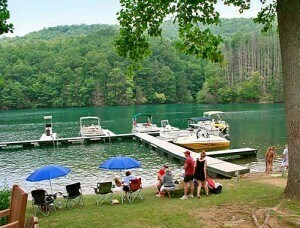 Stop by Lake’s End Marina for canoe rentals, or buy your own kayak for your cabin home. The summer is coming to a close, but today is the perfect day to seize the sunshine and voyage to places unknown. Kayaking on Lake Nantahala: Which Kayak is right for you? Choosing the right kayak for your Lake Nantahala adventure is the first step. Lakes are a great place for paddlers. 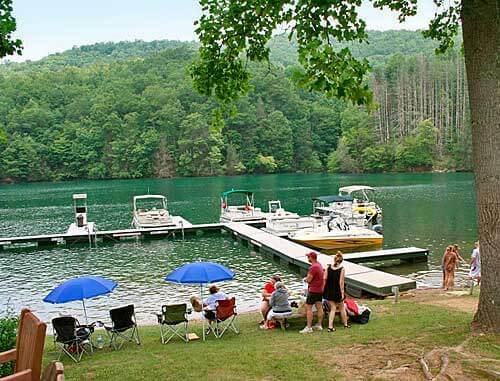 If you love to kayak or canoe, or think it’s something you’d be interested in, the calm but large waters of Nantahala Lake provide the perfect scenario for beginners or experienced paddlers with beautiful and scenic views and easily maneuvered waters. With close proximity to the Nantahala Outdoor Center and the rapids of the Nantahala River, kayaking in the area allows you access to both rougher rapids and the calm, serene paddling of the lake. 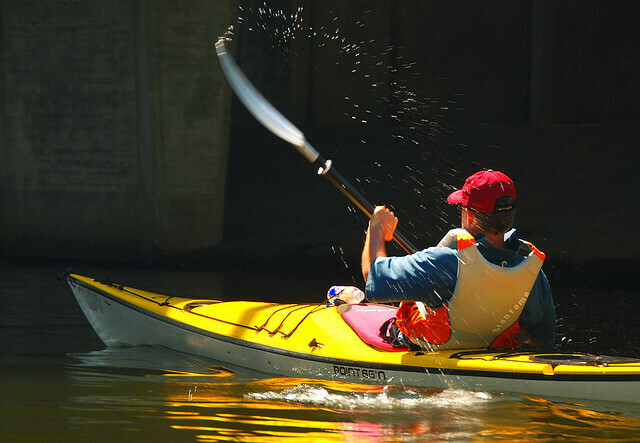 Do you know which kayak to get for your sport? Here’s a guide to help you pick the kayak that will meet your needs. 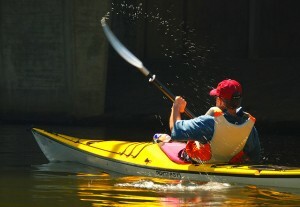 Do you need a recreational kayak, whitewater kayak, or a touring kayak? Do you plan to just take basic cruises around the lake? Would you like more stability in your kayak for beginner’s assurance and for taking photos? If so, a recreational kayak is probably for you. Do you want to try out your kayak on multi-day trips along a camping route? Would you like for your kayak to be used in the lake and the ocean on vacations? Will you need to transport gear in your kayak with you? A touring kayak will fit your needs better than a basic recreational model. Do you want to be able to use your kayak on the rapids of the NOC along the Nantahala River, as well as the calm waters of Nantahala Lake? Consider investing in a whitewater kayak; these kayaks are built for the rushing rapids of a powerful river, unlike your basic recreational model. Photo via U. S. Fish and Wildlife Service – Northeast Region via Flickr CC.